Its probe is focusing on a requirement regarding "prompt and timely removal of snow from all aircraft movement areas"
The Federal Aviation Administration said Tuesday it is investigating the actions of the Port Authority of New York and New Jersey after a winter snowstorm caused major disruptions at Kennedy Airport earlier this month. Its probe is focusing on a requirement regarding "prompt and timely removal of snow from all aircraft movement areas." The snowstorm created days of cancellations and delays at the airport on Jan. 4 and several days after. A burst pipe at the primary terminal for international flights on Jan. 7 also caused major headaches for air travelers. Port Authority Executive Director Rick Cotton said last week the primary problem appears to have been international airlines arriving without available gates at the international terminals. Cotton has said what happened was "completely unacceptable." Port Authority spokesman Ron Marsico said the agency "will completely cooperate with the FAA's inquiry." 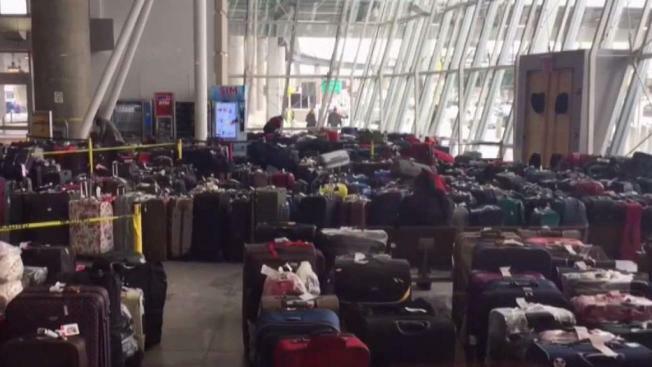 Nearly two weeks after the blizzard, dozens of passengers are still looking for their suitcases lost in the Kennedy Airport chaos. 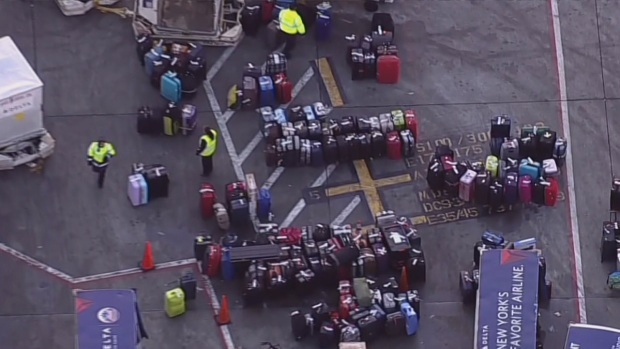 At the height of the baggage disaster, tens of thousands of bags were separated from their owners, sources said. Maureen Murphy was visiting her family in Morris County, New Jersey, over Christmas when she got a call that her aunt died in Ireland. She made the trip to Dublin and back, but her luggage is lost: "I have no idea where it is," she told News 4 over FaceTime from Atlanta on Wednesday. Nancy Yachouch flew into JFK on Norweigan Airlines during the storm, and got diverted to Albany, where the plane sat on the tarmac for four hours. Then she and her fellow passengers took a bus to JFK, where her luggage couldn't be found. That was on Jan. 6, and 11 days later, still no bag. "I feel like I'm being lied to," she said. "I'm just frustrated and disappointed and I never want to check a piece of luggage." 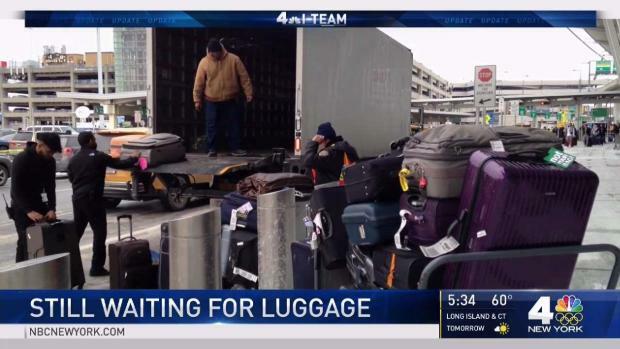 Sal Santiago and his wife, who are from Long Beach, waited eight days -- only to learn some of their luggage was still at JFK. "They said, 'Yes, your bags are here,'" said Santiago. "But in a secure area, and we can't give 'em to you." One bag finally showed up, and then on Jan. 9, the second one appeared. But one more suitcase is in limbo somewhere, and "they don't have the slightest idea where that third bag is," he said. Like so many, he's been calling Delta, only to get stuck on the telephone version of a baggage carousel -- around and around. Santiago says he regularly gets put on hold for an hour and a half every time he calls. Delta told the News 4 I-Team Wednesday it's now down to a handful of bags yet to be reunited with owners. Maureen Murphy is hoping her burgundy duffel is among that handful. "God knows what it's gonna like like when I get it back," she said. "How hard is it? A list, numbers? Find the bag." 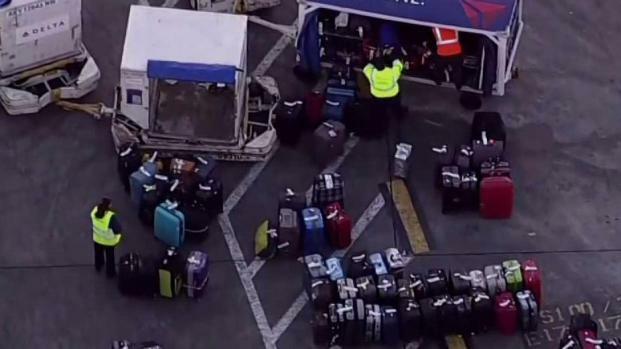 One luggage delivery company contracted by Delta and Norwegian to return the amassed baggage has also been the target of customer ire. 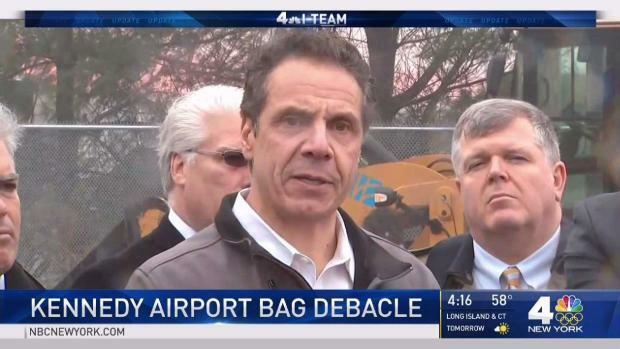 BEX is based near JFK Airport, and Billy Hassell, the auto body shop owner that leases the space to BEX, told News 4 that in more than a decade, there's never been anything like the recent baggage tsunami. The owner of BEX told News 4 over the phone that all the bags have been delivered. Former Transportation Secretary Ray LaHood is conducting an investigation at the Port Authority's request, focusing on coordination between international airlines and privately operated terminals. Sen. Charles Schumer said Monday he wants federal transportation officials to urge foreign airlines to work better with the operators of the airport. The Senate Democratic leader from New York wrote a letter to the Transportation Department, saying the department issues documents allowing foreign airlines to operate in the U.S. He suggested that it "utilize that leverage" to encourage them to "develop more meaningful communication systems and contingency plans" with Kennedy's governmental and private operators.